Little Rock drivers may know that all 2008 model year and newer cars, mini-vans and light trucks in Little Rock come with a tire pressure monitoring system. Many slightly older vehicles around Conway, Arkansas have these systems as well. A tire pressure monitoring system – called TPMS – consists of sensors on each wheel that measure tire pressure. If tire pressure drops 25 percent below the car maker’s recommended pressure, the sensor sends a signal to a monitoring unit that causes a warning to light up on the dashboard. When Conway, Arkansas drivers see the warning light, they know it’s time to put some air in the tires. There are many benefits to driving with properly inflated tires around Little Rock. First is cost savings. Running at the correct air pressure improves gas mileage. Driving on under-inflated tires is like driving through sand – it drags down your fuel gas mileage. You’ll also see longer, more even tread wear so your tires’ll last longer. Another important benefit of properly inflated tires is increased safety. Under-inflated tires become hotter and that heat can actually lead to tire failure – possibly resulting in an accident. Your car and the tires themselves will just perform better and more safely around Little Rock with properly inflated tires. Local Little Rock consumer groups, law-makers and auto makers advocate TPMS systems hoping that they will save lives, property damage and inconvenience. While you can’t put a value on saving a life, Little Rock drivers should keep in mind that TPMS systems aren’t free. The systems themselves are added into the price of the car. The batteries in the sensors will have to be replaced from time to time. Parts will break and need to be replaced. In colder climates around Arkansas, ice and salt are frequent causes of failure. Little Rock service centers such as Parkway Automotive must purchase equipment used to scan and reactivate the TPMS system after every tire service. Because older tire change equipment can damage TPMS sensors, your Conway, Arkansas service center may need to buy expensive, new tire changers. Since there is no uniformity among auto manufacturers, service professionals need to be trained on several TPMS systems. These behind-the-scenes costs are very real to Little Rock service center managers like Mike Mike at Parkway Automotive. That’s why the team at Parkway Automotive is anxious for Conway, Arkansas drivers to understand the financial impact of TPMS systems. In the past, we’ve been able to quickly and cheaply provide tire services, and then pass the low cost on to Conway, Arkansas customers as an expression of our good will. But now even these simple jobs take much longer and require expensive equipment. So when you start so see the cost of tire changes, flat repairs and rotations going up in Arkansas, please keep in mind that it’s because of this new safety equipment. The team at Parkway Automotive just wants to keep you safely on the road – and we’re committed to doing it at a fair price. Contact Parkway Automotive for more information about Tire Pressure Monitoring Systems. Virtually all vehicles come with power steering so many Little Rock drivers have never driven a car or truck without it. Power steering assists you when you turn your truck steering wheel. Without it, it would be very hard to steer. Now this power assist comes in a couple of forms. 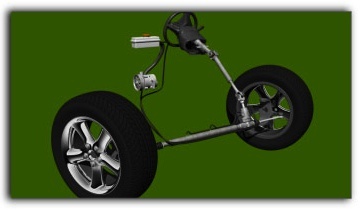 In recent years, a lot of Conway, Arkansas vehicles have an electric motor that reduces steering effort and helps improve fuel efficiency. The other kind of power steering is hydraulic. This is the kind most older Arkansas vehicles, and a lot of newer ones, have. Power steering fluid is pressurized by a pump and is used to assist steering. Of course, Conway, Arkansas drivers need the right amount of fluid in the system. If it’s too low your steering is affected and you could damage your truck pump. Also, power steering fluid can become corrosive over time and damage the pump, hoses and connectors; leading to leaks and repairs. Power steering service at Parkway Automotive in Little Rock includes removing the contaminated fluid and replacing it with fresh fluid. A word about power steering pumps: Some are powered by an electric motor. Others are driven by the serpentine belt. A worn serpentine belt stresses all of the truck components it drives, including the power steering pump, so replace the belt at Parkway Automotive as advised to avoid undue repairs. Losing your power steering while driving in Little Rock can be unsettling – just remember that you can still steer, it’ll just be harder. Check with your honest Parkway Automotive service professional to see if it’s time to service your truck power steering system. In addition to power steering service, at Parkway Automotive we offer comprehensive automotive services including oil change, oil change and Vehicle Health Check-Ups.